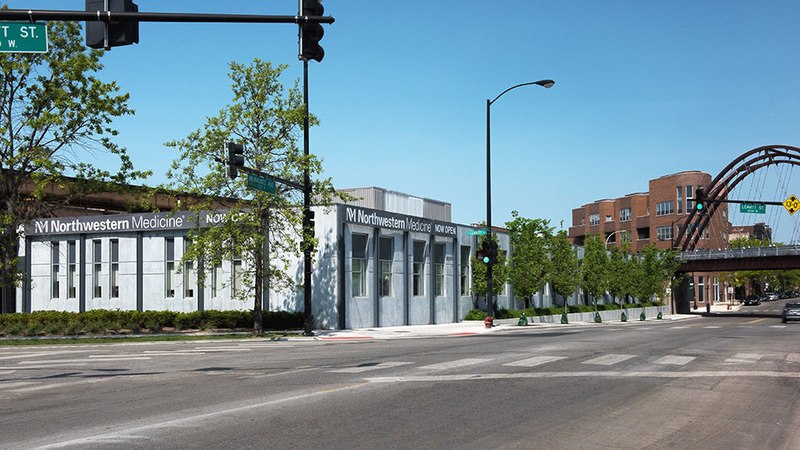 The Northwestern Medicine Bucktown location provides patients with convenient primary care, dermatology and imaging services. Northwestern Medical Group offers a wide variety of patient services to help you stay healthy, stay informed and to prepare you for your visit. The medical staff at the Northwestern Medicine Bucktown radiology outpatient clinic offer diagnostic radiology services that include bone density scans, mammography (breast imaging), magnetic resonance imaging (MRI) and X-ray. Over 30 free parking spaces are available in our parking lot, which you can enter from North Leavitt Street (west of Milwaukee Avenue). Street parking is also available on North Milwaukee Avenue and other nearby side streets. Northwestern Medicine Bucktown is located at the Corner of N. Milwaukee Ave. and N. Leavitt St. It is between Damen and Western Aves. and sits alongside the "606" elevated trail bridge. If driving, take the Kennedy Expressway and exit westbound North Ave., turn right on Milwaukee Ave., then turn left on N. Leavitt St. and finally turn right into our parking lot. Another option is to exit the Kennedy Expressway on westbound Armitage Ave., turn left on N. Leavitt St., and pass N. Milwaukee Ave. The CTA's Blue Line train stops at Damen Ave. or Western Ave. Our building is about four blocks north of Damen Ave. or south of Western Ave. For specific connection information, please contact the Regional Transportation Authority at 312.836.7000.